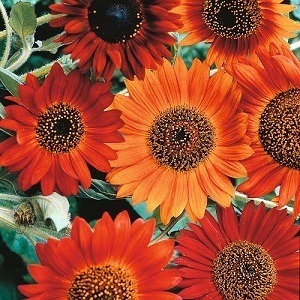 A very tall Sunflower, with a mix of dark red flower heads from June/July to September. These are wonderful border plants, growing 2-3m in height. They are also good cut flowers. And popular with children, as they are easy to grow and make reliable spectacular flowers. Sunflower ‘Earthwalker’ prefers full sun and moist well drained soil. Pack of 50 seeds. Sow in late winter/early spring indoors or sow in late spring directly into the ground. Sowing instructions and a colour photo are printed on the packet. Sow in late winter/early spring 10mm deep in small pots of seed compost. 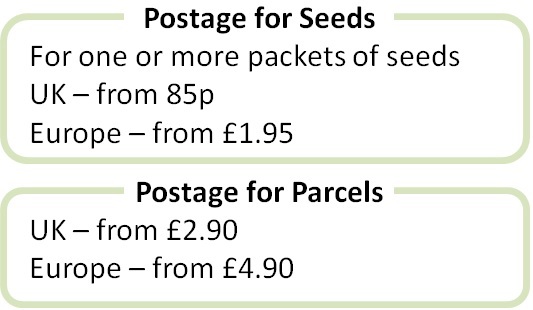 Sow 2-3 seeds per pot, with the pointed end of the seed facing upwards. Keep at 20-30°C and keep moist. Germination takes about 1-3 weeks. Transplant seedlings to bigger pots when big enough to handle and into the garden after the last frost. Or sow in late spring directly into cultivated soil at a depth of about 10mm. Keep moist until seedlings are established. Protect young seedlings from slugs and snails, especially if sown directly into the ground. Grow These plants grow in spring, flower in summer and then die in winter. Fertilise plants for better flowers. Remove the dead plants in winter and start again with seeds in late winter or spring. Sunflowers form big seedheads after flowering and these can be left in the garden over winter to feed the birds.